Do you have a website? If you are a small business owner, the answer should be YES. In fact, I would argue that you should put more time and money into your website than any printed materials besides for packaging. Your website is your home base. It’s where most of your customers will look before deciding to buy your product, whether it is your time or an actual physical object. It will be well worth your while to have a beautiful website. So what should be on this website you ask? I will tell you. The first page is a welcome. Hello, how are you? Please come into my website, love what I do, stay awhile. It should have that type of feel. You want people to open the page and feel as though you’re standing at the door with a hot cup of tea and a smile. Then perhaps there is a page with images, a sort of online portfolio. This is where you’re going to put your product up that you’re selling. If it’s ceramics, make sure the pictures are beautiful and well-lit. If it’s your time, make sure to have pictures of clients up there. Then we go to a page about what’s going on with your business. Any interesting news to report? Just got a new client? Just had success with an old one? Post it. Put it up. Gloat. Next: Press. Do you have any press? No worries if you don’t, but if you do, give it it’s own page. Gloat. Sell yourself. Blog! 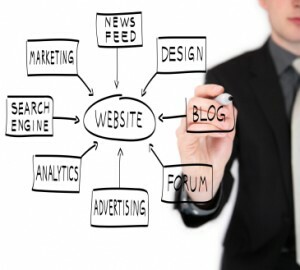 Do you have a blog to go with your business? As discussed, you should. If you do, give it it’s own page. Make it important. Lastly: Contact. There is no point of having a website if you don’t let people know how to reach you. Agreed? Yes. I personally prefer when I see an email address I can pick up directly rather than filling out a form for someone to get back to me, but whatever you’re comfortable with is fine. Some other things to include on the website, most likely on the first page, are links to your social media accounts. Facebook, Twitter, LinkedIn, you know the drill. And also, a button your followers can press to subscribe to a newsletter if you have one, or blog postings. Just remember your website is there to sell you and your product. Put the time and effort that deserves into it. A good example of a website that incorporates all this and more is Bryn Alexandra Interiors. For more reading on the overview of PR in a small business, including websites, check out this awesome Design*Sponge post.